Next piece in my prehistoric animal series. Thought I'd take a break from dinosaurs, and take a shot at the mighty Megalodon. I had a lot of fun with this one. Original plan was to feature the shark on its own, but decided he needed something to eat. Sculptris + ZBrush + Photoshop. Nice. Have you drawn an anomalocaris? I think those creatures were insanely interesting looking. lol the orcas are fucked! Excellent man. That's a good thing to have a reconstruction of meg depicting a lamniform not too much great white-like in appearance. 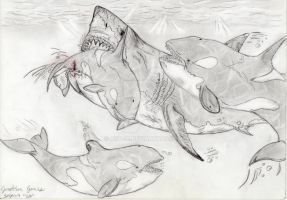 However, it is notable to say that the modern orca and C. megalodon didn't colive together. 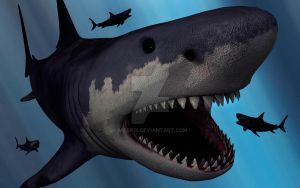 The orca that probably met C. megalodon was 4 m long Orcinus citoniensis. It had smaller, more numerous teeth than its modern, larger relative, and certainly wasn't a competitor for adults megalodons. 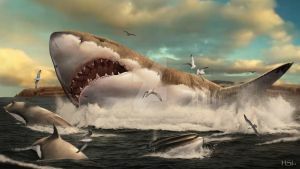 According to paleontologist Mikael Siverson, this is after C. megalodon vanished that orcas grew larger and took the niche of marine top predators. Thanks for the thoughtful comment. Yeah, I took some liberties here for sure, but just thought it'd be cool to depict an orca as a shark-snack. Indeed! Glad you like it. Thank you! Fabulous. I love how you had the shark attacking the tail of the orca, like some scientists predict the shark would have done, similar to Great Whites. The way its teeth are thrust forward it also amazing. Great work of art overall. Thank you for the thoughtful and kind words. I appreciate it. beautiful art but would be better if fighting a prehistoric sperm wolf pack whales over a dead carcass of recent kill. i love the way you show size with a human figure. idea predator x versus unknown but yet to be found kind squid like kraken ( i don't believe we have found a the prehistoric invertebrates of the deep oceans). mammoths fighting off 2 short nose bears to protect its clubs . I could not image how native Americans survive these giants mega predators like dire wolf, short nose bear,saber tooth lion.etc. here a idea sketch a family in watching television in there living room couch aka California all their eye are fix two giant sliding glass patio window as one of these apex predators walk across their yard as (for humor) 3 of pets one small and large dogs bark at glass. and you see the house cat (smart) book it pass it owners for somewhere to hide. 3rd idea early bird catches and worm? show 2 guys in fishing attire about to leave 2 go fishing on one side of truck and terror bird on the other side. the guy just put his keys in door a just look across across his vehicle notice this creature eying them. I appreciate your thoughtful comments. You've got some good ideas. Coincidentally, the next in this series, which I just started today, will be a Columbian Mammoth. see something i did not known elephant specie reach that far down in the Americas(or do mean Columbia usa or canada). i was so happy when they found those giant turtle and crocodile and that mega snake (forget name) that got science or discovery show just lucky they allow science into that rock corey. do you work skeletons in a museum or just a concept artist. please note creationist believe those animal with sharp teeth were vegans before adam or eve ate apple in usa . (but if tell them eve was from african and black and that all humanity share common linage they loose their minds).it like when talk about tyrannosaur rex arm was to small how could hunt must be a scavenger but leave out most all large jaws sauropods arms were getting small. if you help or little help or humor,sci fi, prehistoric for project let me know i no science major just concepts. i would do that image if your drawing for kids but if drawing for yourself or magazine you have to open your mind. example one may lion can only kill baby elephant could never harm a adult. but remember kimono dragons ancestor got to incredible size eating pygmy elephants well reptile are not mammals true. (i wonder what that giant in australia ate) . thou bear do not hunt in pact( but their territories must have overlap) i could see a few hunting together looking for old and young or recent teenage males kick from herd( sure the not share kill ). elephants,dolphins(whales)hippos and humans are animal that look out for each other but the 1st 3 are closely related. imaging the nightmare torn trunks and smash bear skull but likely. i can not imagine crossing Bering strait in alaska with just primate projectile weapon and spears. i can not how man survive and what kind of fortification one will build.these where modern humans that cross over faxing these same beast over and over again. Then that would mean another Jaws series.